One of the most robust features in WildStar is housing. There are so many things you can do with it (which is why I love doing Yardcore videos!). As such, there are some beautiful landscapes that folks have designed that just take your breath away. This landscape happens to be on a housing plot. The plot belongs to a former guild member, and I took it at the time because there was a glitch with one of the harvesting plugs. A survivalist gathering node had appeared inside the Hot Springs FABKit (pre-made plugs you can put on your plot), and we thought it hilarious and totally worth a screenshot. As I was going through my screenshot folders to find a good one for my last NBI Safari post, I stumbled upon this shot and thought it worked. The water FABKits are some of my favorite, and here’s to hoping that one day we’ll have water effects/blocks to use in housing! 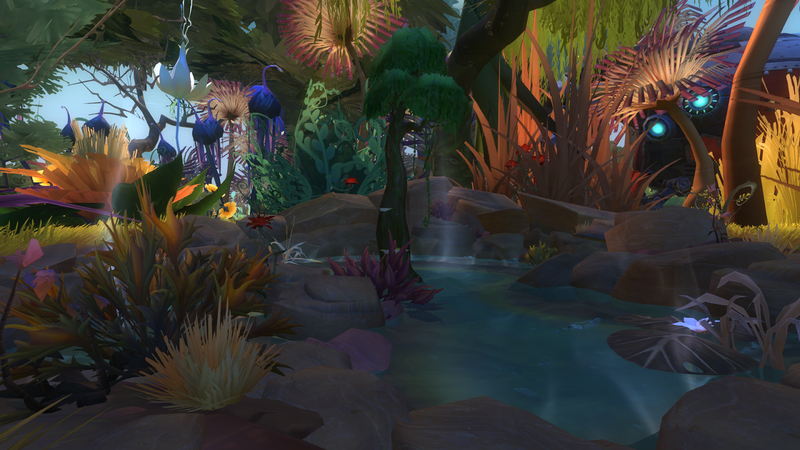 It's shots like this that make me want to try WildStar in the fall. You totally should. 🙂 I'll definitely be writing about the F2P stuff when I hopefully test it on the PTR/"beta".